We are THE beer and liquor delivery service for Innisfil. 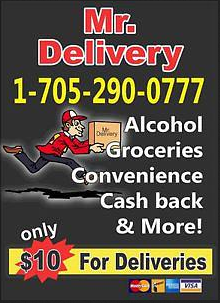 No need to dial a bottle, or call a beer, we can give you speedy delivery in Innisfil. Only $10 plus $2 for any additional stop. We will deliver your groceries to your door! It's $10 for your first 15 items, and an additional $5 for each 10 items after that. Call or text your order, we may call you back from the store to more efficiently collect your items. We also deliver convenience items, cash back, and anything else you need!